Last day for changes and additions is Wednesday April 17. Last day for cancellations for a full refund or credit is Thursday April 18. New Fashioned Lamb Cake Layers of fudge and buttermilk cake filled with white chocolate mousse and mini chocolate chips. Frosted with our meringue buttercream and coconut trim surrounding the little lamb’s face. Burnt Almond Cake Layers of golden buttermilk cake filled with vanilla custard. Toasted sugared slivered almond surround the tops and sides. The San Jose specialty cake comes to Sacramento! Lemon Zinger Lemon poppyseed cake topped with a generous amount of lemon mousse. Topped with a layer of our tangy lemon curd. Easter Egg Cake Marbled golden buttermilk and chocolate cake ﬁlled with chocolate mousse. Egg shaped and covered with chocolate decorated with colorful ﬂowers. One Size. Layers of buttermilk cake frosted and ﬁlled with cream cheese frosting. Finished with toasted coconut. Princess Cake Golden buttermilk cake with thin layers of raspberry preserves, chocolate ganache, vanilla custard, and whipped cream. Topped with a layer of sweetened marzipan. One size. Chocolate Charlotte Rich chocolate mousse sitting atop a chocolate cake base. 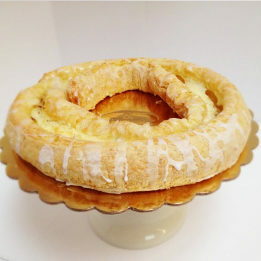 Surrounded with ladyfingers and an Easter ribbon, finished with a garnish of whipped cream. Most of our cakes are available in larger sizes. Champagne Cake Layers of our golden buttermilk cake sprinkled with champagne. Filled with strawberry custard mousse. We add white chocolate shavings to the sides. Fast becoming a Freeport customer favorite. Fudge Cake An old fashioned chocolate layer cake with a rich fudge filling and frosting. This one is a classic! Fruit Basket Cake Three layers of our golden buttermilk cake filled with fresh strawberries and fresh bananas. Frosted with fresh whipped cream. Hands down customer favorite. Spring Cake Decoration Add a spray of spring flower decoration on any cake. Easter Cookies Choose from bunnies, or Easter Eggs. Boxed, bagged, on imported trays or by the piece. Our Old School Easter Basket Cupcake is Back! Choose from golden buttermilk or chocolate We add green coconut, jellybeans, & with a pastel handle. Pies and Fruit Tarts Fresh Fruit Tarts, Lemon Meringue, Banana Cream, Deep-Dish Apple, Berry, Peach Olallieberry. 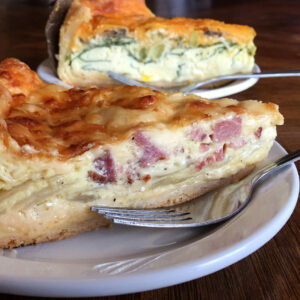 Quiche Add our quiche to your Easter brunch. 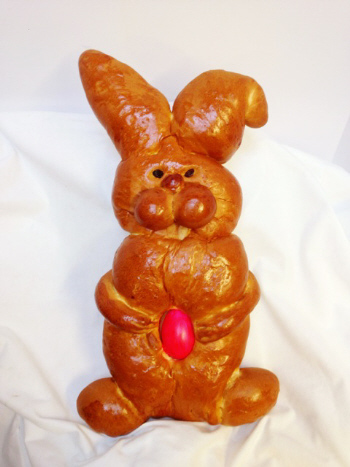 Bunny Bread Sweet, buttery egg bread shaped like a bunny. Makes a great hostess gift. Hot Cross Buns Our sweet egg bread ﬁlled with golden raisins. 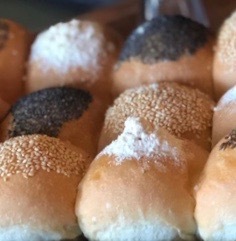 Dinner Rolls, Bag of 6 Each order comes in 1/2 dz. Pull-Apart Lemon Curd Hot Cross Buns Seven of our hot cross buns with lemon curd baked together.